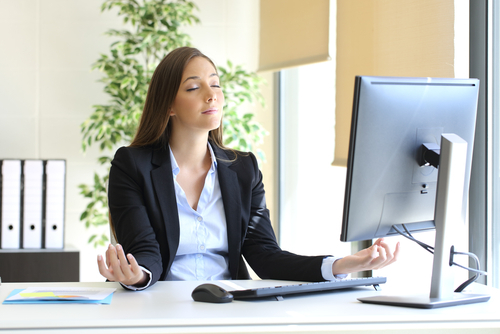 How do you Bringing Mindfulness Into The Workplace? Hours have gone by. When was the last time you looked at the clock? Have you stood up out of your chair today? You found that sought after, treasured flow state and there’s nothing wrong with that. Now that your flow is fading out, you’re fatigued, the strain is coming on, and you’re slowing down. Did you eat today? Are you even breathing? You take a deep breath and realize you can’t remember if you took a deep breath yet today. Being a business executive or a professional has its pros and cons when it comes to the flow state. We get so swept up in our work, so laser focused, so unstoppable with our task management, that we lose our sense of mindfulness. Nothing comes between us and our goals for each day, week, month, and year. As many professionals and executives know, Unfortunately, sometimes, that means our work gets in the way of our mental health. For some of us, that eventually means our struggling mental health gets in the way of our work. Mindfulness is an evidence-based, proven practice for bringing balance to your work life and your mental health. All mindfulness is, at the core of the practice, is the ability to be aware, to notice, to pay attention, and to breathe, bringing you into the present moment. Mindfulness is proven to enhance critical thinking, creative thinking, executive function, memory retention, and focus- all of which professionals need to continue excelling in their job. Meditate on your lunch break: Taking a lunch break is important for balance. Get up, walk away from your desk or office, and preferably step outside into the sunshine, if there is any. Meditation takes nothing more than closing your eyes and focusing on long, deep, slow breathing for five minutes. You can plug in your headphones and tune into award winning apps like Headspace to get a guided meditation. Create a No-Notification hour: Depending on your profession and the requirements of your job, you receive a lot of notifications: project management apps, text messages, voice messages, a secretary, your email, office conversations, and more. Set aside time each day to be one hundred percent present without the interruption of notifications. What you do with that time is up to you. Perhaps instead of tasks, you strategize, daydream, write down ideas, or get some exercise. Pay attention to your needs: There is a phrase in recovery, HALT, which stands for Hungry, Angry, Lonely, Tired. Flow states and high productivity are amazing until you’re too hungry, you’re cranky, you haven’t spoken to or seen anyone in hours, and you need a nap. Mindfulness helps you pay attention to your needs and acknowledge that you deserve to meet them when they come up. Take a nap: Naps are proven to help boost brain function and productivity. An over-exhausted brain leads to erratic moods, erratic behaviors, and stress which can trigger mental illness symptoms. Just a twenty minute nap can set you up for success the rest of the day. Should Doctors Fear Losing Their License Over Mental Health Issues? How Can Depression Affect a Person’s Work Motivation?